In seven years as a resident and staff member at Lost Valley Education and Event Center (Dexter, Oregon) I’ve seen many people come and go, and arrived at the view that the bigger the contrast between a community’s culture and that of an incoming resident, the more likely the fit won’t be good long-term and the person won’t stay. For example, if cigarette smoking is very rare in a community and a new person spends a lot of time at the smoking spot, there is a cultural disparity. That’s tame in and of itself, but add a half-dozen other such small variances, and soon you have the picture of someone who may feel like they’re in the wrong place, and leave to find the right place. At some point, healthy diversity leads to unhealthy distance. #1—A couple came from a region known for separatists and gun racks. They were well-matched in some respects, such as being ethical, non-militant vegans. But their residency lasted only a few months, partly because their strong culture of independence chafed under community process and oversight. #2—Over the winter a new resident moved in with a clear “player” attitude to a community where no one cares about such things. Talk of fancy cars was one indicator of cultural incongruity. In the end his attempt to move straight from Texas capitalism to an ecovillage in Oregon was too big a jump, though made gallantly. A second factor was equally important in this case, though—communication style. He struggled to be clear and concise, and had a tendency to react defensively to feedback. This particular instance I consider to be partly a mismatch of culture and partly about communication skills, which are necessary in well-functioning community. A relevant component is how the person responds to such subculture divergence. Two recent individuals came to Lost Valley wearing a lot of fragrance. Within a few weeks one was told this was challenging for some individuals around her, and she cut back her use of perfume dramatically, eliminating the rub with apparent smoothness. The other individual responded that his cologne collection was worth $1000, as if to say its expense validates its use. Their contrasting responses to feedback about cultural disparity was an indication in itself of how well they’d do in the community. What lesson can be distilled from these experiences? It is helpful if prospective residents get a clear snapshot of the culture of a community they’d be joining before diving in, so there are no surprises down the road (or gravel trail, as it may be). Characteristics of a community’s culture are rarely stated—being subtle and unofficial—but it’s useful to actually write them out. In the case of Lost Valley, I’d say we’re into healthy food, personal/spiritual growth, calm communication, natural ecosystems, ecstatic dance, nonconventional education, permaculture, humility, slow pace/process, agreements/rules, sandals, tie-dye, yoga and meditation, and child freedom. In contrast, here are some common elements of mainstream American culture that are not popular at Lost Valley: television, chit-chat, fanaticism about pro/college sports, fashion, fancy possessions, factory-made jewelry, makeup, brand logos, gourmet coffee, generic meat, packaging, guns, sarcasm, and vices of distraction. Such characteristics of the unofficial culture of a community matter, but even more central are its values. It’s possible enough that a well-groomed Type A person will jive well at Lost Valley, but if they don’t share the community’s high value on transparency or honesty, say, it would be surprising if all goes well. But I won’t get further into values match right now—the focus of this piece is culture. There is even a geographic component to culture jive. Someone coming from nearby can use knowledge of the region’s culture as a helpful steppingstone. People moving to Lost Valley from Eugene (18 miles away) often understand the crunchy culture of the Pacific Northwest, whereas an arrival from Wisconsin or Colorado may succumb to this additional hurdle (as someone did in a recent case). Of course, culture gap isn’t a clear predictor of success in a given community—there is a correlation but not necessarily causation. The question is about likelihood of success, a general pattern found over many experiences, and thus not a forecaster of whether a specific person will fit well in the community long-term. It’s similar to how eating a lot of vegetables and getting a lot of cardiovascular exercise correlate with low levels of heart disease. They pan out over a volume of people, but we’ve probably all heard of a stout relative who “ate bacon and eggs every morning and smoked two packs a day and lived to age 92.” So this isn’t a formula that can be applied to a given case, but it is helpful for communities as they try to recruit people who are likely to be long-term members, and not just bounce off and have to be replaced. #1—RJ came as a student for Lost Valley’s three-month Holistic Sustainability Semester. In his 60+ years of living in the Deep South he had zero experience in intentional community, he regularly called himself a “rank amateur” in permaculture and just about everything else we do at Lost Valley, and comes off 30 years of straight-laced clinical work. Yet he has panned out swimmingly (as a student and now as a resident), taking it all in stride and happily adapting to a way of life he likes much better than the conventional variety he was previously steeped in. #2—The longest-running family at Lost Valley moved from the heat and conservative culture of the Central Valley of California. The father Dan—originally from Denmark—is a very entrepreneurial sort and for years supplemented his income with poker winnings. These elements are in contrast to Lost Valley’s general culture, but it has nonetheless been a successful match. Why is it that RJ, and Dan and family, have worked out well at Lost Valley? I see in both cases a willingness to personally put in effort, a flexibility to adapt to the reality of the community, and being at a point in life where they are truly ready for community. This last characteristic is in contrast to a recent resident (whom I’ll name Toby) who turned out to be too focused on “me” and not enough on “we.” He initially tried hard to integrate into the community, hustling home from his day job in the city for community dinners. But Toby couldn’t internally sustain this for more than a month or two—once his true colors were seen it was clear he wasn’t ready to share. This was less about cultural difference (he jived with the Lost Valley culture in some ways, and in other ways not) but rather about essential personality characteristics. Toby showed himself to not be emotionally mature or reasonable, the two core attributes I think every communitarian needs to exhibit; these indeed trump cultural difference as key determiners of good fit. Because he had these attributes another recent resident who drove a Porsche and led a jet-setting lifestyle did well at Lost Valley, despite the cultural differences. The present magazine’s theme is culture, though, not maturity, so I’ll return to my main premise. It’s also worth saying that diversity and healthy heterogeneity are fed by having new folks not be like the existing community members. If the culture jump is nil the community is nothing more than a herd of clones. So a healthy balance needs to be found in which new blood is somewhere between parallel and perpendicular to the extant culture. In conclusion, what do we do with this notion, the correlation between small culture gap and long-term gel? I think the best use is to find residents who fit the community’s subculture in enough ways that their transition will be smooth—a step, not a leap. For example, putting out a craigslist ad in an area where the intentional community is a cultural island is not a great idea, while putting up flyers at the closest co-op (or other aligned hub) might be. The more residents who stick, the less work the recruiting/onboarding folks have to do, and the healthier the community is long-term. Another application of this is simply noticing signs in a given instance, as indicators. At Lost Valley, “We should build a gym here” (real example) or “He’s totally into computer games” may give insight in one direction, while “She’s studying herbalism” or “The pace of city life really gets to me” (recent examples) might show the opposite. Either way, take it with a grain salt, one arrow in your quiver of community discernment, along with feeling out the prospective resident’s communication skills, values match, reasonableness, and maturity. 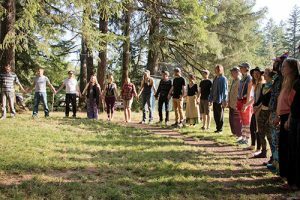 Colin Doyle is in charge of programs at Lost Valley Education and Event Center in Dexter, Oregon, where he’s lived in the community (called Meadowsong Ecovillage) since 2010. He is a regular contributor to Communities. Favorite activities include intelligent conversation, geography, storage gardening, and exploring the biggest mountains he can find.